AceReader is an award-winning software program designed to increase your reading speed, comprehension and fluency. It is the only program that uses time-tested, patented and research-based technology that also has a 20-year proven track record. It is sophisticated yet fun, and it is very simple to use. Rather than develop multiple products, we have focused on making one simple-to-use program that has multiple benefits. AceReader is primarily designed to assess and improve reading skills, but it also includes fun eye/brain games, vocabulary exercises, memory exercises and SAT/ACT prep exercises. Content includes interesting, themed, educational material in the areas of American History, Earth & Space Science, Famous People, Fun Facts and General Knowledge. Since our content is “leveled” into 13 different text complexities, it is ideal for readers of all ages. AceReader also includes a powerful eReader (Tachistoscope) that can be used for educational as well as productivity purposes. StepWare, Inc. began 20 years ago as a research and development company, providing high-end educational programs to schools and individual consumers. They developed the Classic desktop editions of AceReader. 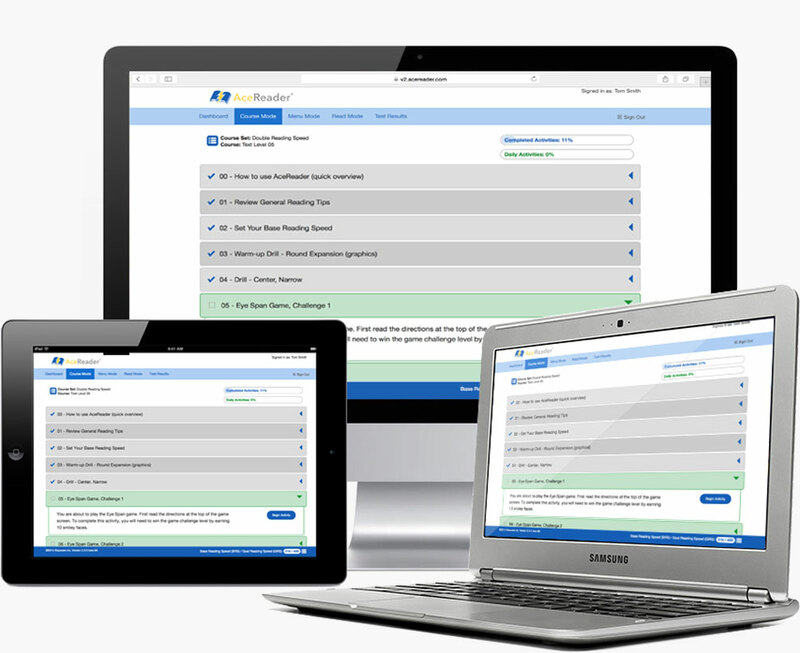 As a result of its success and demand by educators and consumers alike, in 2016, AceReader, Inc. was formed as a spin-off dedicated solely to the development, sales and support of AceReader's new cloud-based generation of products. As we move forward, the primary mission of AceReader, Inc. is to concentrate on its Education cloud-based edition of AceReader for schools. Individual consumers and families can still purchase the Classic Desktop editions or our newest cloud products that use the same technology developed for schools with our Personal and Family editions. We are continually motivated by the knowledge that AceReader is truly helping so many customers, from students to professionals, improve their reading skills. Our goal is to continue bringing you the highest level of technical excellence and customer satisfaction. We are enthusiastically committed to continue our efforts of enhancing our products to help meet the needs of our ever-changing world.